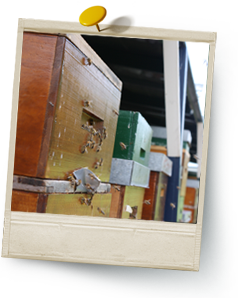 Our honey bees live in a well-organized social community of worker bees, drones and a queen. It is an extraordinary organization, and all the bees in a colony cooperate intensively, and everyone has his own task. In the first two weeks of her life, the queen mates with various male bees, the drones. After this, the fertilized queen may lay more than a million eggs a year for 3 to 5 years. She lays one egg in each cell of the honeycomb. Once the larvae hatch, they are nourished with royal jelly, pollen and nectar. On the eighth day, the cell is covered by a layer of wax, after which the larvae pupate into fully-formed bees. The drones are the male bees. They are fed by the worker bees and it is their task to fertilize the queen. They also use their hairy and bulkier bodies to help heat the brood nest. Of the approximately 50,000 bees in a colony, no more than 300 are drones. After the summer months they are no longer fed and therefore die. During the first 3 weeks, the worker bee works as a housekeeping bee: she cleans cells, feeds on honey and pollen and nourished the larvae (nurse bee). After the first 10 days of her life, she starts building intricate honeycombs composed of hexagonal cells (construction worker). After 3 weeks, she flies out, at first hesitantly, a little later fully focussed, then becoming a forager bee. She collects nectar, pollen, propolis and water. The worker bee is highly flexible. If necessary, she can become a housekeeping bee again.